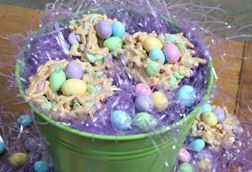 "These Easter nests were fun to make and fun to eat! They make a nice display ... read full review"
Easter time is a great time to make fun candies, cookies, cakes, and desserts. 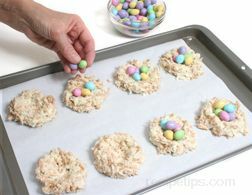 It is always a sign of spring and there are many fun Easter treats that can be made. 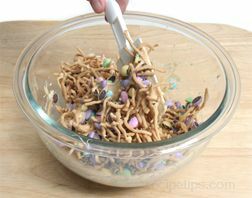 The Easter nests below are fun to make and the kids always enjoy filling them with their favorite Easter candy. It is fun for them to eat the candy out of the nest and then be able to eat the nest also. The recipes below show two different varieties of Easter nests. Both use chow mein noodles, which provide the nests with a real appearance, but each variety is also made with other ingredients that give each of them a distinctive look and taste. 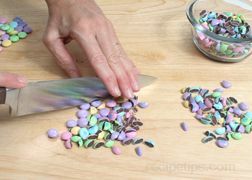 Chop the Plain M&M's into smaller pieces using a large knife. Walking the knife across the candy in a similar manner to chopping herbs works fairly well. Set the chopped candies aside to be added later. 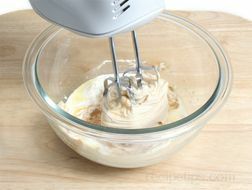 Add the marshmallow creme, peanut butter, and melted butter to a mixing bowl and beat until evenly mixed. 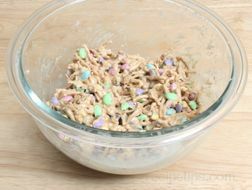 Add the chow mein noodles and the chopped M&M's to the creamed mixture and stir in by hand. 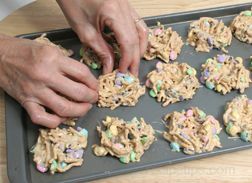 Stir mixture until the chow mein noodles and M&M's are coated evenly. 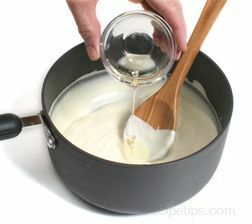 Using a heaping tablespoon of the mixture, drop a mound onto a lightly buttered cookie sheet. With buttered fingers, form each mound into a rounded shape and make an indent in the middle to make them look like little nests. Add Peanut M&M's to each nest to make them look like they are filled with eggs. Set them aside to allow them to firm up. Use the nests to dress up your Easter table by placing a nest at each place setting or just add the nests in with your other Easter treats. 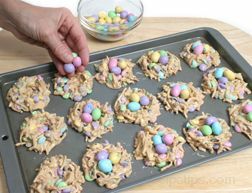 Get Peanut Butter Easter Nests recipe. 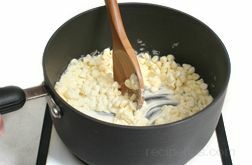 Melt the white chocolate chips over low heat. 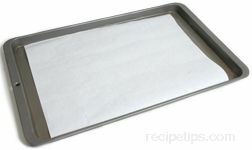 Do not use too high of heat because if the chocolate overheats it may separate and become grainy. 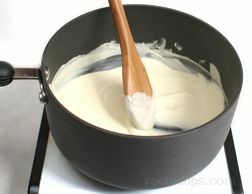 Stir the white chocolate until it is all melted. The candy nests will make a nice addition to any Easter centerpiece or candy dish. 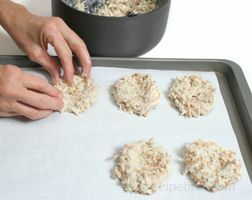 Get Coconut Easter Nests recipe. 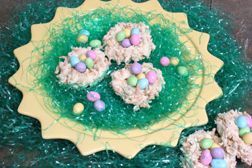 "These Easter nests were fun to make and fun to eat! They make a nice display for Easter also." 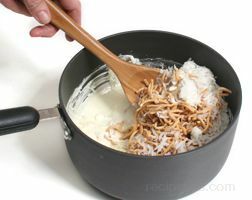 "I love coconut and chow mein noodles so these nests look delicious and fun to make. 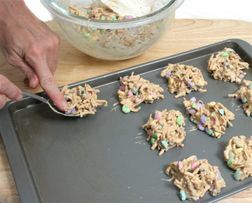 I am going to give them a try and then let the kids help fill them with Easter candy."